Between August and November, the trade marketing office of Brazilian consumer-goods industries generally go through the planning period for the following year’s budget. The objective of this process is to have some prevision over the expenses, investments and potential return on the business. The final document of this process is a business plan, by brand, category and sales channel, that integrates into the marketing, logistics, production and financial plan that companies submit to their shareholders in Brazil and abroad. This article is particularly directed to all those trade marketing managers who at this moment are pouring their efforts into mounting the business plan that will enter into next year’s budget. It is also a recipe for being happy all-year long in trade marketing – a method of planning and working that will allow trade to use just the best ideas in the trade marketing plan. Apart from this, it will facilitate the relationship of this area, with all the rest, by showing how to say “No”, without feeling guilty, to any proposal that does not integrate, reinforce or mobilize the strategic incentives of your company’s brands within the trade marketing plan for the coming year. During the budget period, apart from very few hours sleep and all the stress among senior trade marketing managers, it is common to see these professionals accumulating the difficult task of disputing funding for its area with that of marketing (communication) and with sales (the so-called commercial funding). This requires an intense effort to prove the worth of your own proposals and, for this reason, only the best must be used. The absence of this type of pre-alignment creates situations in which the salespeople cannot manage to implement a large number of promotions, competitions and initiatives alongside the direct and indirect channels of distribution. This happens simply because the number of actions, when all added up, make the flow of the commercial relationship impractical. I have heard of cases of companies where a salesperson has had eleven actions in five different categories to present to his interlocutor in a large foodstuff distributor – something really non-viable. We would like to make a contribution for trade marketing managers by presenting the 10 steps to a very successful trade marketing plan. A learning tool that integrates finance to the process of trade planning is also available (please request by email at contato@toolboxtm.com.br the file containing the learning tool in Excel). – 10th step – Risk analysis. • Social, economical, cultural and technological context. Group together all the ideas and good practices sent by Sales, Trade, and Trade and Shopper marketing agencies. As yet, there is no managerial evaluation of the actions, they are just grouped by either channel of category of products to which they refer. Try to score the value of the opportunities, quantifying the financial gains from a “macro” vision. In this point, the trade manager must ask him/herself “How much is this opportunity worth?” If there is no numerical answer, in terms of profit margin, market share or sales increase, probably the idea should not be contemplated in the trade marketing plan. Tip: In my experience, as a trade professional since 1997, the champions for sales increases are: reduction of rupture, followed by an improvement in the efficiency of restockers, salespeople or distributors and sales promotions. equating the resulting profit of the increase in sales for the industry, or brand, and the cost or investment involved in carrying out this action. The aim is to avoid the trade marketing manager using just his personal opinion to evaluate the actions and, thereby, becoming susceptible to being taken by colleagues as someone who is subject to predilection and whim. It is therefore important to use a set of fixed criteria in both the analysis of viability and in that of prioritization. example, “counter-balancing the increase in the price list” by means of incentive promotions and sell-out (increase in turnover). Actions with low scores should be excluded from the plan to be presented to the board of directors, and knowing how to calculate the ROI (Return on Investment) on trade marketing will greatly help the manager to prioritize these. Nevertheless, as the capacity of sales to execute many actions in the field is restricted, from the practical point of view, the strategy will only come to realization when the salespeople are capable of executing it together with some client. The brand plan, plans of clients and the capacity of sales executing proposals should be considered. 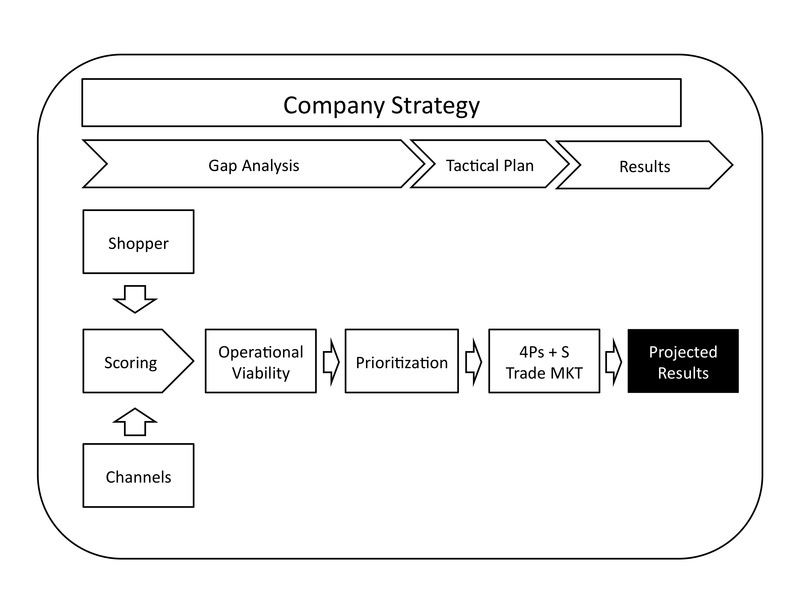 As such, the prioritization is the key to profitable growth of mass consumer-goods companies. On this point, the manager must formalize the premises in order to calculate the results of each action, including how he/she arrived at the return presented, and the metrics of success of the proposal. The ninth step is a continuation of the eighth. Here, instead of taking each action, one by one, presenting individual results, all the selected actions are added up in terms of their sales increase, costs and increased profit margins. This allows the manager to present an integrated budget proposal (investments and costs) and of the potential increase in sales (which will go toward the commercial target), apart from the potential gains in market share (to be considered in the marketing budget – products). obligatory, but if it is made, and eventually used, it will demonstrate the degree of maturity of the trade team. The tip is to create an alternative plan with high-impact-on-results actions and ease of implementation, but which further have a score below the rest in requisites such as strategic alignment and non-financial impacts. Don’t forget that, in the hour of need, results will always speak louder. Particularly if the problem affects the company in the short term. If you wish to know more about this process, read “Trade marketing – distribution strategies and sales execution ” – Ed. Atlas/ 2010 (D’Andrea e Consoli), or request the learning system in Excel by e-mail from: contato@toolboxtm.com.br.